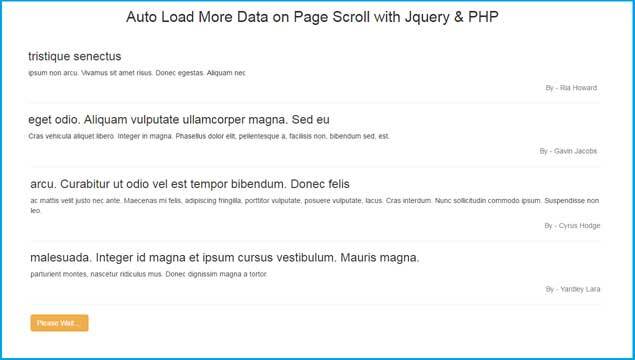 In this post, we have make discussion on how to auto load data on web page dynamically when user scrolls the page by using Ajax JQuery with PHP Script. We have already make this type of tutorial on which we have load data on web page by clicking on button, but in this post we will load data on web page when user has been scroll down the page. For loading Dynamic data on page while scrolling of web page, when user has been scroll the page then at that time Ajax Event has been fire and it will send request to PHP Script for getting data from Mysql table. It will fetch data from table and convert that data to HTML format and send back to Ajax request and it will display on web page. In this post we have use scroll() event of Jquery to fire Ajax request. First we have define two div tag, in one tag we will display table content in HTML format and in second div tag we will display one button with text like please wait. In JQuery we have make on function that fetch data from table and display on web page in specified div tag. In this function we have use Ajax request that fetch data from table and convert them to html format and display on web page. After making of function then after we want to display on data on web page by calling above function, so we have write one if condition which check if action variable value will be inactive then it will execute if block and under this we have called above function and in this block we have also change action variable value will change to active. Then after we have go to PHP page and this page has been received request from Ajax with two variable like limit and start and based on this variable value we will make simple select query which fetch data from table and then after it will convert into HTML format and send back data to Ajax request and Ajax request will display on web page. Now we want to write jquery code when page has been scroll so we have write jquery scroll() event, so when page has been scroll then this event of code will be fire. Under this block we have write if condition which check if height of div tag with $load_data has been greater than windows height and it also check action variable value must be inactive. If this condition will true then it will execute if block and under this block we have first change action variable value must be change to active and we have also increase the start variable value increase by value of limit variable. After this we have called load_country_data(limit, start) function under setTimeout() function for called this function for waiting of one second. So, this is our simple web tutorial on load data while scrolling page down with JQuery Ajax and PHP.